Last Friday, Cody's Books in Berkeley sponsored an event on "Race, White Privilege, Social Justice and Hip-Hop" (yeah, you know, small topics) which featured a powerhouse panel comprising of Adam Mansbach, Jeff Chang, Tricia Rose and Dave Stovall. Judging by some of the comments left in my last post about race/rap, I get the sense that some would rather assume that we've moved to some post-race identity politics when it comes to hip-hop. However, Friday's panel only confirmed that issues of race, far from becoming moot in our age of vapid multiculturalism, are more pertinent (and complex) as ever - especially in hip-hop. One common agreement amongst the panel is that hip-hop's popularity has resulted in a situation where Blackness is being consumed like never before but without requiring any form of contact with the Black community whatsoever. Both Adam and Prof. Rose raised that point that previous Black cultural forms - such as the blues or jazz - often encouraged non-Black fans to literally travel into Black neighborhoods as a way to listen or take part in them. 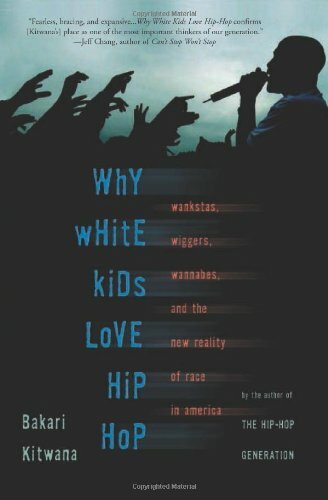 However, as media distribution has become increasingly divorced, geographically speaking, from the space of production, it's not all surprising that you could have a generation of youth raised on Black culture (in the form of hip-hop) who've never interacted with a single Black person in their own lives. This isn't a new observation of course but I've yet to see that many people really probe the implications and problems that arise from this phenomenon. Obviously, it forces non-Black hip-hop fans to interrogate what they contribute (or fail to contribute) to contemporary race relations and maybe it's precisely why the topic is so frequently elided. To add onto this, Adam made the point in saying that if we're talking about white privilege, he feels that too many white listeners of hip-hop presume that just the fact of their consumption habits is already a sufficient political gesture. In other words, the mere fact that a white kid listens to hip-hop is somehow revolutionary since it's supposed to represent some implicit rejection of conventional whiteness. Adam pointed out 1) that's hardly anything new - white youth have been rejecting whiteness through the consumption of Black culture for 100+ years without having improved race relations in that same amount of time and 2) he said something to the effect of: "the opposite of white privilege is not blackness - it's the dismantling of white privilege." In other words, one does not destroy white supremacy by identifying with Black culture or even Black people - that act alone isn't sufficient to undo the legacy of systemic racial inequality and oppression and that to assume that it does actually only compounds the problem. This is something that William "Upski" Wimsatt tackled ten years ago in his "Aren't I a Special White Boy" essay in Bomb the Suburbs but again, it seems like few have listened to his insights. Prof. Rose raised an age-old question that people still argue endlessly over: why is hip-hop so popular across social lines? She argues that it has little to do with the aesthetics of rap (in terms of its lyrics and music) and has everything to do with its "performance of a certain kind of black masculinity." In noting that, she points out that there is definitely the potential for a beautiful kind of cultural contact that can arise from the desire to connect with those forms of Blackness but the emphasis here is on potential which she doesn't think has been remotely fulfilled yet. (By the way, Rose isn't arguing that there's nothing appealing about hip-hop on an aesthetic level, but as she notes, there are many forms of Black cultural production that are aesthetically impressive, not just hip-hop, yet hip-hop is far, far more popular. She's arguing that hip-hop's performance of a particularly virile form of Black masculinity is the key difference). Switching topics - Dr. Rose also relayed an experience she had teaching a class on hip-hop at UC Santa Cruz: she had asked volunteers from her class to help put together a set of songs that represented the Oakland underground scene. The first students to volunteer were white and they put folks like Too Short, the Coup and Hieroglyphics in the mix. A few days later, some of the Black students in her class approached her and put her up on Keek the Sneak, Mac Dre and E-40 instead. When she asked her Black students why they were listening to Keek, Dre and others but NOT the Coup or Hiero (whom she considered to be more sophisticated both aesthetically and socially), they replied, "because White kids like them" which seems to reflect the long-held wisdom that if you're too popular with White folks, you lose credibility with Black folks (see Digable Planets and Arrested Development). Prof. Rose expressed her concern that it's now become the case that Black youth are only into the most (in her words) retrograde, nihilistic and misogynistic elements of hip-hop out there and rejecting more progressive, intelligent and sophisticated artists. Her concern was that this was creating a death spiral of values and aspirations amongst Black youth. This is similar, to me at least, to other critiques raised by folks like Mark Anthony Neal and Greg Tate, all of whom are from an older generation (40+) of hip-hop fans and whose attitudes on this issue have been fiercely debated by younger fans. 1) Where do Latinos and Asian Americans fall into this mix? This went unmentioned during the panel. On one hand, their appreciation of hip-hop partially (if not largely) stems from the perception that they too are members of a marginalized, racialized community. Therefore, they feel that hip-hop "speaks to and for them" on a level that doesn't as readily apply to Whites. On the other hand, it's not as if A) communities of color work together in harmony. If anything, the historical record reveals that White Supremacy has been exceedingly effective in creating incentives for groups to turn on each other in the hopes of gaining a slice of White Privilege. And B) Latino and Asian Americans are just as capable of conflating consumption with contact - enjoying the fruits of Black cultural labor without contributing to any material solidarity with Black people. 2) What can we do to maximize the potential of hip-hop to create cross-cultural contact that is not exploitative and builds meaningful relationships and solidarity rather than reifying a tradition of cultural colonialism? Let me add that I don't think you can attack this issue at the level of consumption. As Adam pointed out - preventing Whites from accessing Black culture only increases their desire for it and moreover, Black cultural producers rarely control the means of distribution and so long as 99.9% of rappers are more than happy to sell their records to anyone who wants to buy them, it's unlikely that there can be a movement to reverse the conventional flow of cultural consumption. What you can do, however, is try to find a way to use consumption as the starting point to something more productive. My question is: how do we find that way?